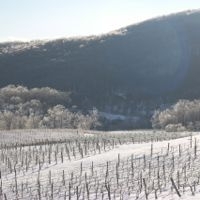 Jim Law of Linden Vineyards in Virginia sends this report of northern hemisphere activities this month. January is a month of rest for the vines and the grower. This seasonal pause allows the grower a time of reflection rather than reaction to the rapid-fire succession of small problems and decisions during the growing season. In January one goes for a leisurely stroll in the vines. They are no longer clothed in their green foliage. Their nakedness reveals more to the grower's eyes. Young vines are well formed, vigorous and strong. Old vines are hesitant and gnarly showing the warts and scars of a long life and the past abuses of a young, inexperienced winegrower. This is when the planning decisions are best made, without the distractions of the growing season. The biggest decision is when to remove a vineyard block and eventually replant. This decision is both emotional and economic. Time is money, and pulling out a vineyard requires a couple of years of leaving it fallow and then three to four years before the new vines begin to produce. It's emotional, because there is a sense of failure. A decade or two ago the best pre-plant decisions were made, but things didn't turn out as planned. Some vineyards are pulled out because the vines are virused, but in our fledgling region most of the vines are removed because, frankly, the wine isn't as good as anticipated. We tweak, we experiment, we manipulate, but eventually one has to surrender. This decision is usually made several years in advance of the actual removal. The vineyard management then switches to palliative care. Replants cease, trellises are no longer maintained and pruning focuses more on function than on form. With hesitation and caution, pruning commences. It would be better for the vines if we held off until March, but it couldn't get done in the one month before April budbreak. Besides, we have completed all our replanting, trellis repair, and record keeping. Everyone has taken time off. There is nothing more to do but prune. In Virginia it is best to wait to prune for two reasons: winter damage and wood diseases. Twenty years ago these were major issues, but lately we seem to have become more complacent in our concerns. Credit goes to luck (global warming) and more focused management. Vine buds will be killed if temperatures fall below -5º to -10º F (-20º to -23º C). If we do have potentially damaging temperatures, bud mortality can be evaluated in each block. Back in the 1980s we regularly saw mortalities of 50% to 90%. We would adjust our pruning accordingly by simply leaving more buds at pruning. January is typically our coldest month. We can't adjust bud counts on vines that have already been pruned. As a precaution, if we are to start pruning in January, we start with the most cold-hardy varieties. In our case, that would be Vidal and Petit Verdot. While winter damage may be a lingering concern of the past, wood diseases are still with us. Pruning wounds are a major port of entry for a plethora of bacteria and fungi that can potentially wreck havoc in a vineyard. We now have a three-pronged strategy in our vineyard to reduce wood diseases. First, we converted the vineyard to cane pruning from cordon/spur pruning. This greatly reduced the number and size of pruning wounds. The second strategy is pruning as late as possible. This is reserved for the most susceptible varieties, especially Cabernet Sauvignon. It is best to wait for the sap to flow in March when the vines bleed after being cut. The theory is that the sap flow flushes out any disease organisms and the vine heals quicker. Finally, we treat each pruning wound with a laundry detergent called Dreft. While this has been a subject of jokes and ridicule, especially from my European colleagues, I'm not giving it up. A professor at UC Davis recommended it a decade ago. I am not scientifically trained, and have not run trials with controls. This practice was implemented at the same time as pruning strategies changed, so who knows what's really working….or is it luck? The cellar is fairly quiet in January. The main activity is tasting the 2012s. They have now shed their freshly fermented character and settled down enough to show their personality. We taste the white wines to decide on bâtonnage regimes and to project the best timing for bottling. There are a few barrels of Chardonnay that are unpleasantly reduced, so they get our special attention. In January, the reds are the focus. Blending trials are in full swing. December was spent getting acquainted with each individual lot. Linden has a myriad of small blocks of all the Bordeaux red varieties. Most of our blocks are young and for learning purposes we keep everything separate initially. Now potential blends are proportioned in the lab and presented blind to a tasting panel consisting of winery staff, growers and other experienced palates. The goal is to make the decisions, and then physically blend all lots by March. At that time the wines are taken off their lees, sulfur levels are adjusted, and the newer oak barrels are redistributed according to the impressions of our tasting panel.